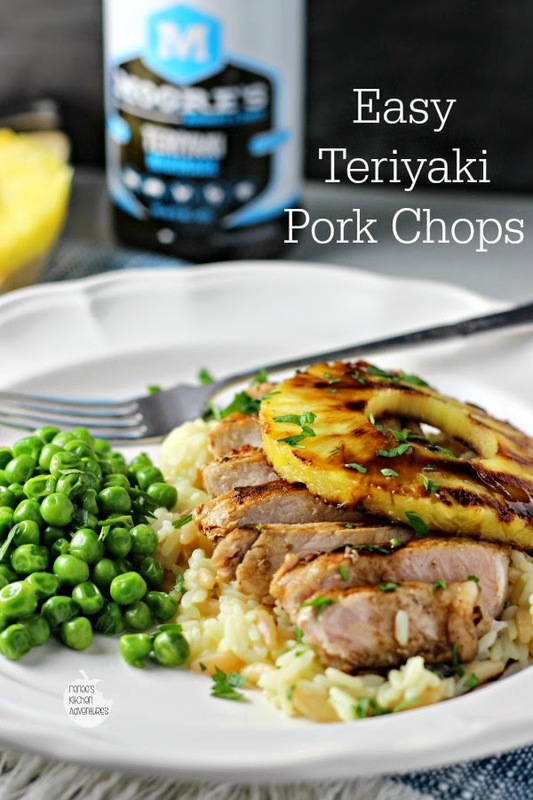 Easy Teriyaki Pork Chops are boneless, center cut chops that are marinated in Moore's® Teriyaki Marinade, grilled and topped with fresh pineapple and more Moore's® sauce for a quick, tasty and easy dinner! (Disclosure: Moore's Marinades sent me product for review. All opinions and photos are mine alone) It's that time of year again. Time to pull out all of your easiest recipes so you can put a meal on the table during the hustle and the bustle of the season. Easy Teriyaki Pork Chops is one of those recipes, made so easy with the help of Moore's Marinades and Sauces. Did you know Moore's makes a great variety of marinades and sauces to help get tasty meals on the table in a hurry? Seriously, if you aren't familiar with Moore's products, you need to be! What is so great about their marinades is that you can infuse flavor into your meat in about 30 minutes! I mean, 30 minutes!!! I can totally do that any night of the week! Even during the busy holiday season which allows me to avoid the pizza/fast food trap we all can fall into this time of year. I used the Teriyaki marinade on these chops and finished them with the Asian Teriyaki Wing Sauce for even more flavor! This quick and easy dinner was done in a little over 40 minutes from start to finish and it tasted AMAZING...with very little work! I put thin boneless, center cut pork chops in the marinade for the suggested 30 minutes, then grilled them up stove top on my grill pan. Make sure you don't overcook your chops if you want to keep them tender and moist! They really only take a few minutes per side. When the chops were done, I put them on a plate to keep them warm and grilled up a few fresh pineapple slices. Once everything was plated, I drizzled Moore's Asian Teriyaki Wing Sauce on the chop and pineapple. This was a really fast, really good weeknight meal! You've got to give these Moore's Marinades and Sauces a try! I can't wait to experiment with some of their other amazing flavors! Look for them at your grocers and to see the complete line of Moore's products and some other great recipe inspirations, visit their website. You can also join me in following them on all their social networks: Twitter, Facebook and Pinterest. 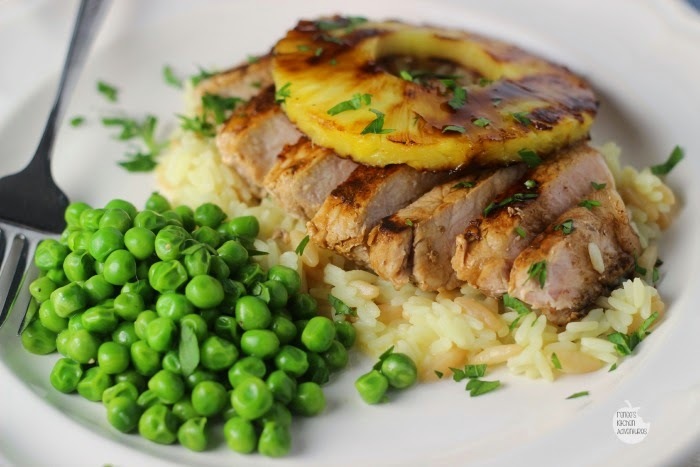 Center cut pork chops are marinated in Moore's® Teriyaki marinade for great flavor, then quickly grilled and topped with fresh grilled pineapple and more Moore's® sauce for a quick and easy dinner option! In a gallon sized zipper plastic bag, put in the chops. Pour a 1/2 cup Moore's® Teriyaki Marinade over the chops and distribute evenly. Allow to sit for 30 minutes so marinade can do it's flavor magic. Heat a large grill pan sprayed with cooking spray on med-high. Sear the chops on each side, until just done. Pork should be cooked to an internal temperature of 160 degrees. To serve, place chops on plate, top with a grilled pineapples and drizzle with Moore's® Asian Teriyaki Wing sauce. I love teriyaki and pork together! Such a fantastic recipe! Renee, this looks fabulous! I'm totally going to be looking for these marinades when I go to the store tomorrow. Love how fast they work! I haven't had a pork chop in so long, I'd LOVE to have one right about now, and I'd love to use this recipe! This looks so tasty and I love that you used fresh pineapple. I bet it tastes amazing. I love how simple this is. I will have to find this marinade. YUM! Pork is my fave! I love how easy this is and it sounds so delish!! I'm all for quick meals this time of year, especially if they're as delicious as this looks! I happen to have a fresh pineapple that needs to eaten. I have the perfect recipe, Thanks! Yum, this looks really delicious. The whole family would love it! I think I am going to die by drowning, in my saliva. I love pork chops! Love. I love Teriyaki anything, these look delicious! I have never tried Moore's s brand, I'll have to try it!